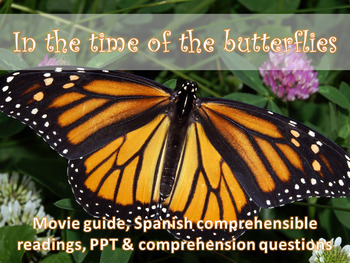 This worksheet and accompanying PowerPoint helps serve as a guide for the film In the Time of the Butterflies. Students have a two page worksheet that also corresponds to a PowerPoint that the instructor uses as a discussion guide. The preview includes the teacher instructions with a detailed explanation of all that the movie guide includes. This is aimed towards an introductory Spanish course.